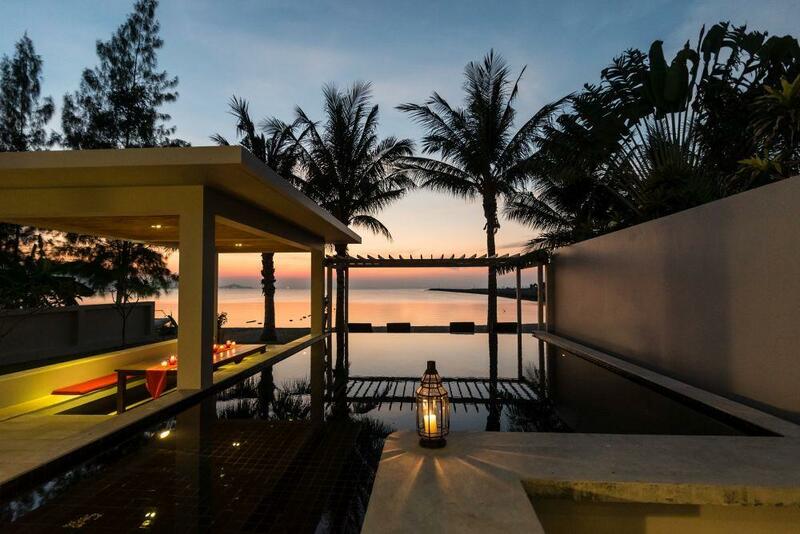 This authentic teakwood villa is destined to become a symbol of Thai elegance on the island of Samui. Recently constructed in Ayuthaya, the former capital of the former Siam, where traditional house-building techniques still survive, it was dismantled and transported then painstakingly re-assembled in Koh Samui. 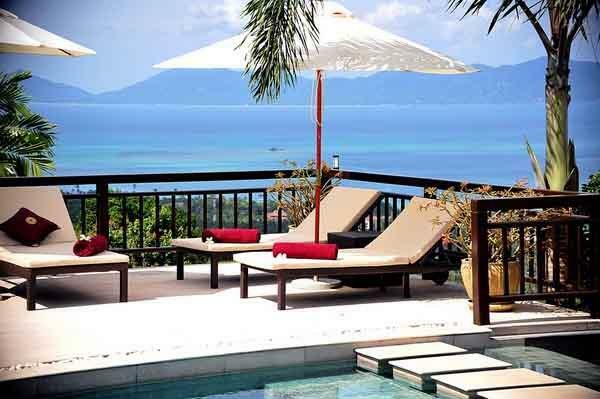 The villa occupies a spectacular location atop a hillside and enjoys unsurpassed views across Samui's northeastern coastline and the straits beyond to the distant outer islands. 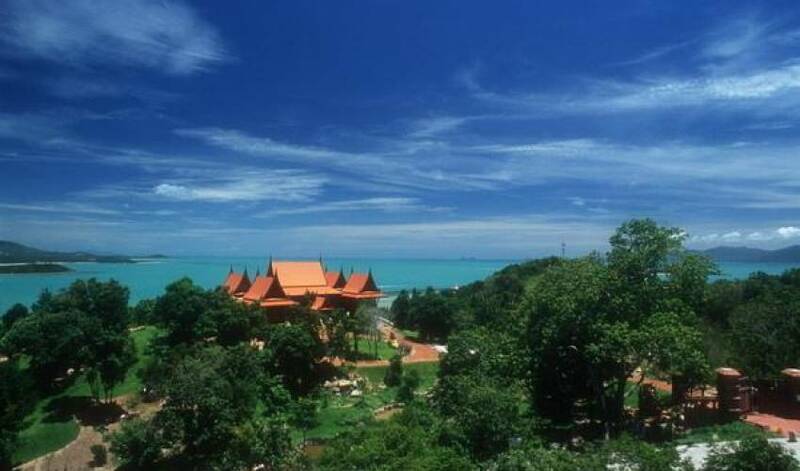 In the middle foreground of the view is the famous Big Buddha Temple, which is the inspiration for the villa's name, and roughly translated means "Buddha View". The villa has been specifically designed by the owner to be his principal home for most of the year and not just as a "villa rental". 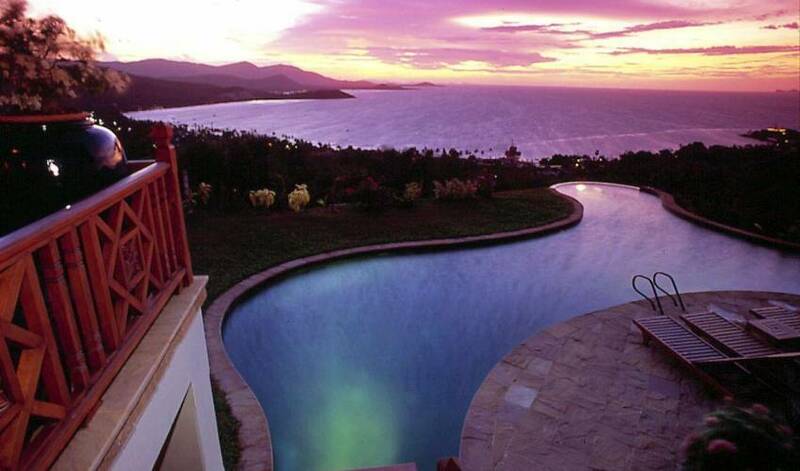 Therefore, those lucky enough to secure the limited rental time available are guaranteed a unique holiday experience. On arrival, the first thing you will notice is a sense of grandeur and space as you drive through the imposing double gates (electronically controlled) along a stone driveway which winds its way to the main entrance. 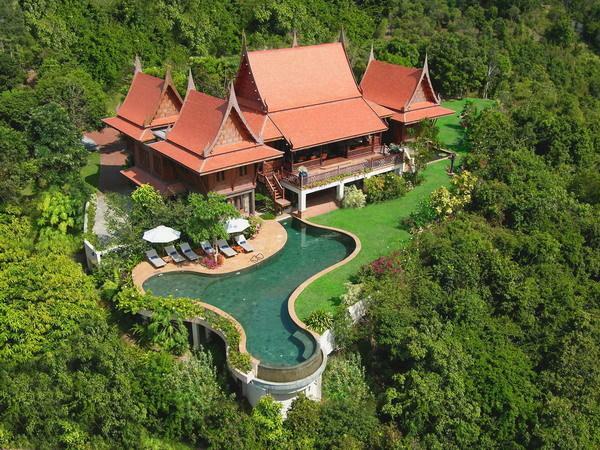 The villa is set in nearly 3 rai (4,800 square meters) of lush private gardens that are home to over 100 varieties of tropical plants, trees and flowers. An intricate network of ponds, streams and waterfalls skirt the front garden, which are not only pleasing to the eye, but also provide added security for the house. 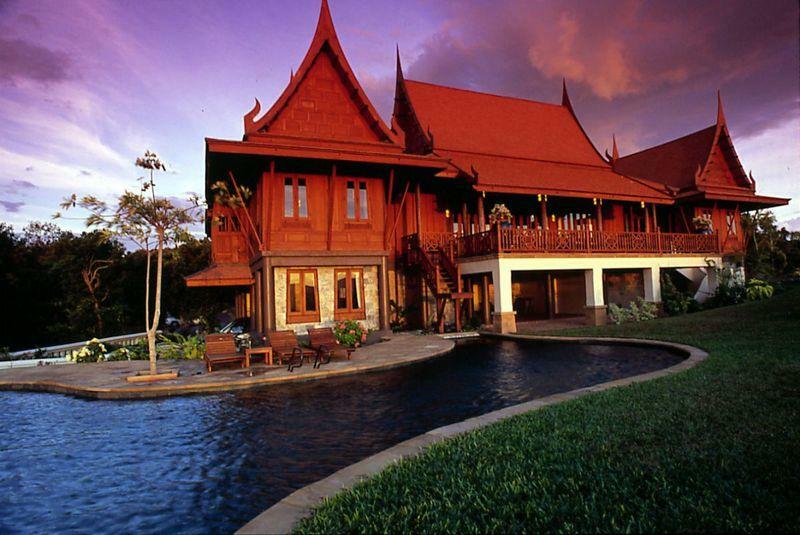 The villa itself is accessed by an ornate covered walkway bridge that crosses a lily pond, leading to carved main doors which are adorned with paintings of Thai dancers. A spacious living area with an abundance of comfortable furniture (complete with satellite TV and a CD player) and an adjacent formal dining area occupy the central sala (building). 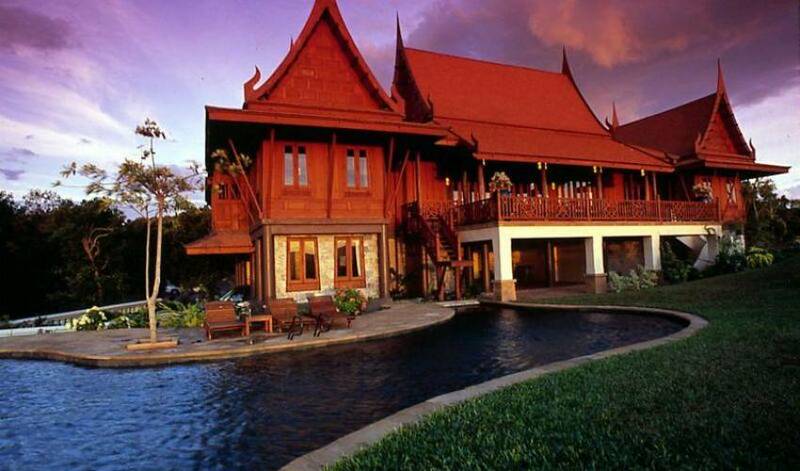 With a soaring Thai roof supported by 16 antique wood columns, this is a truly wonderful room by day and night. Beyond the main sala, and covering its entire width, is a huge covered terrace that may just prove to be the most frequently used part of the villa! It is ideal for casual dining and for simply doing "nothing". There is a choice of easy chairs, daybeds and tables and chairs for writing and games. 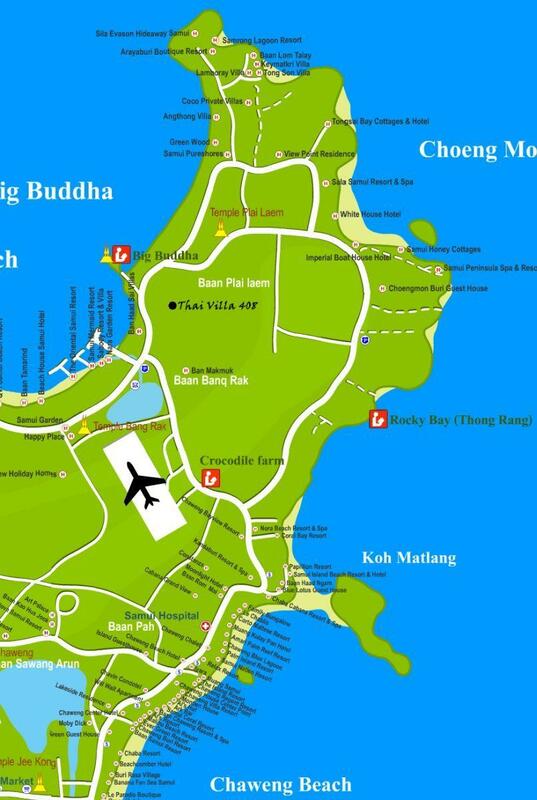 The terrace offers spectacular and unobstructed 180-degree views of the mountains, the sea, the coastline, the Big Buddha Temple and the swimming pool. A steward's kitchen, just off the dining area, services all the living areas. 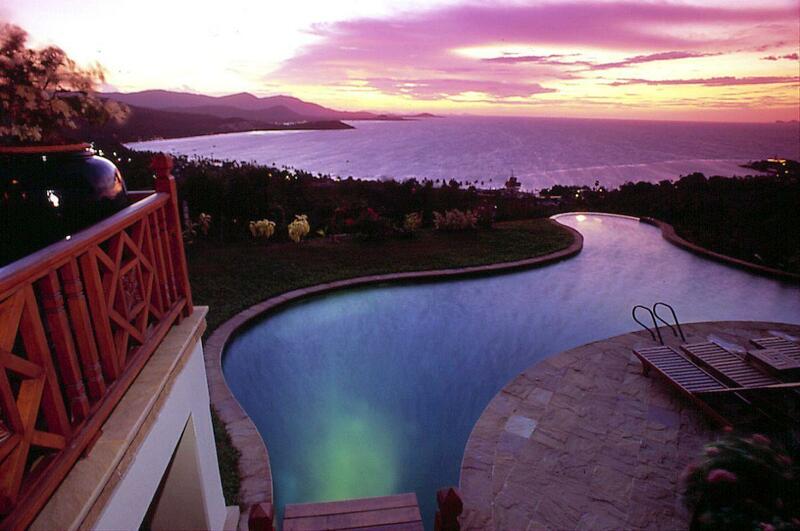 To the right of the terrace there is a diving platform straight into the deepest part of the swimming pool. 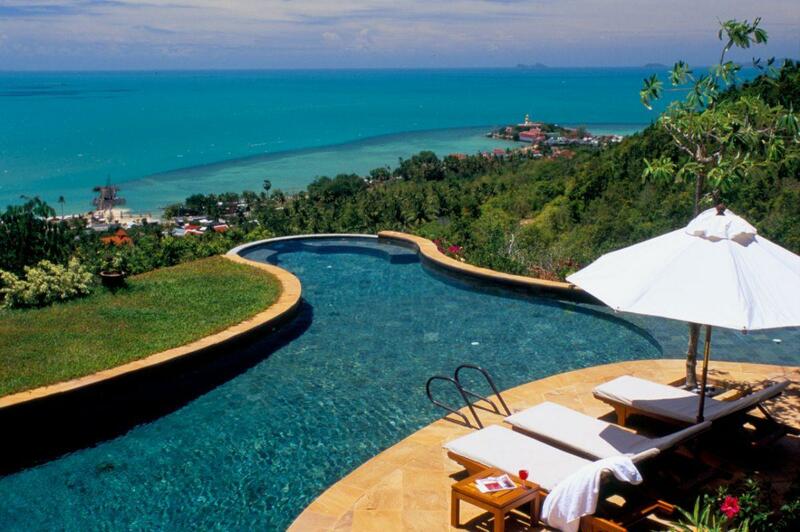 The spectacular free-form pool boasts its own unique views from the "infinity edge" which magically "appears" to merge with the Gulf of Thailand. On either side of the main sala are smaller salas containing 3 luxurious bedrooms (two doubles and one twin) complete with four-poster beds. 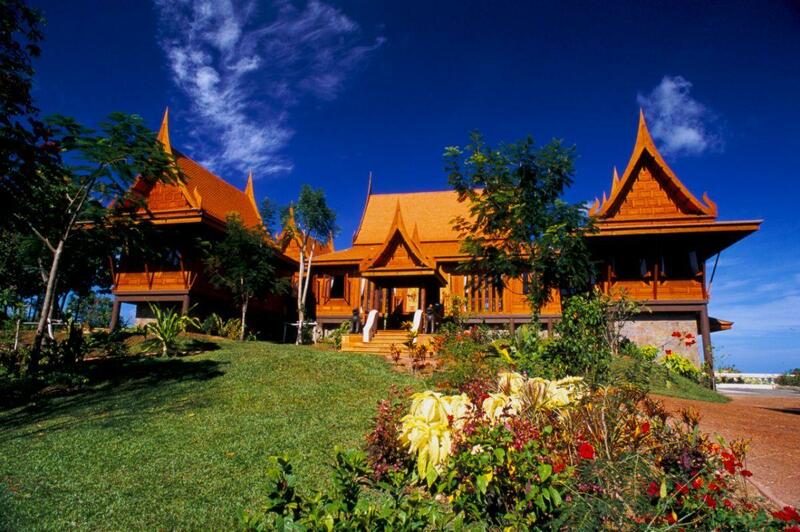 The bedrooms combine traditional Thai style with modern western comforts and facilities. 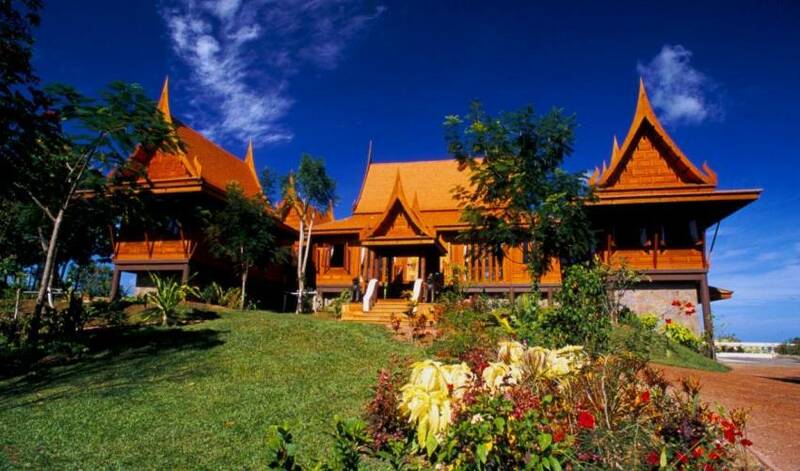 The carved panels, doors and genuine antique furniture are of solid teak and the fabrics are of the finest Thai silks and cottons. As would be expected individual air-conditioning and ceiling fans are installed in all the bedrooms. The spacious ensuite bathrooms, made up of marble, slate and natural stone, have separate imported bathtubs and shower units as well as unique open-air features and views. The master bedroom has the benefit of a large dressing room with floor to ceiling wardrobes and the master bathroom has a Jacuzzi. On the ground level there is a fourth bedroom (double) with a more modern decor and ensuite facilities, ideal for children or younger members of the party. Also on the ground floor can be found the staff quarters, a laundry and a fully equipped modern kitchen. Behind the scenes the villa is equipped with state of the art electrical and security systems, a back up generator and efficient water storage facilities. The Resident Manager is a professional Thai cooking teacher who will happily introduce you to the subtleties of this wonderful cuisine. You can even assist her in preparing your meals, or you can just leave it up to the team to prepare your chosen dishes. For that very special occasion, we can arrange for your dinner to be accompanied by traditional Thai dancers and musicians. 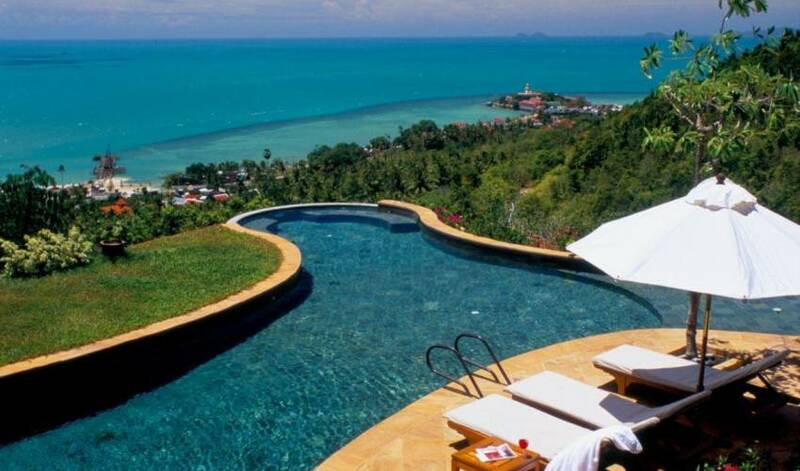 Samui is famous for its variety of spas and your Thai holiday will not be complete without a Thai massage, which can be enjoyed on the terrace in the special massage area. 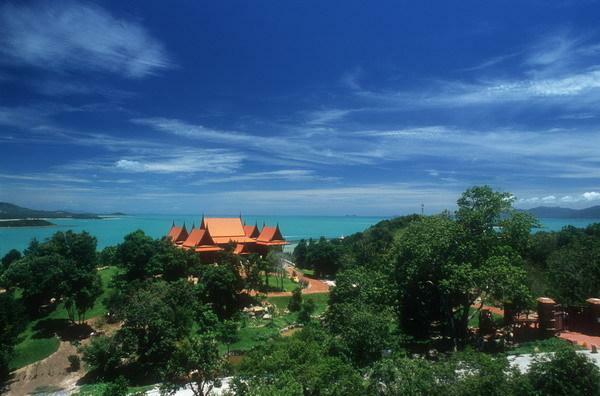 Whilst in Samui you can enjoy the superb cuisine of its many restaurants, the vibrant nightlife and the attractions on offer. 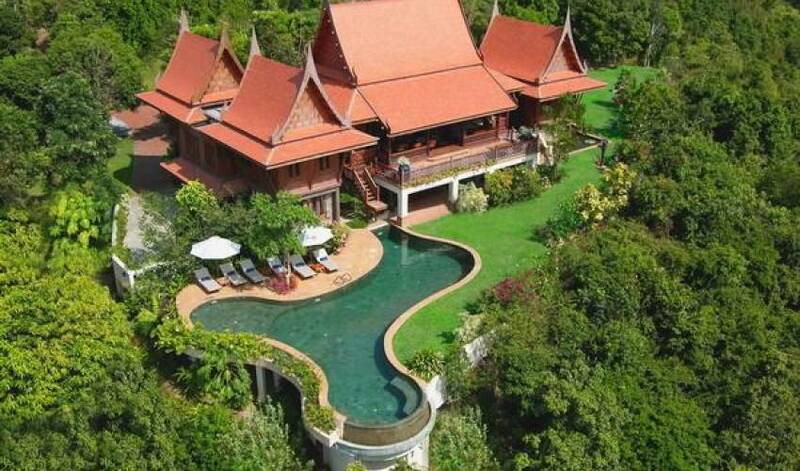 The owner of the Villa just happens to be one of the owners of Poppies Samui, arguably the finest boutique resort on the island. We encourage you to enjoy the dining experience at Poppies or, if you cannot bear to leave the comfort of the villa, we can arrange for Poppies chefs to cater to you in the villa itself. 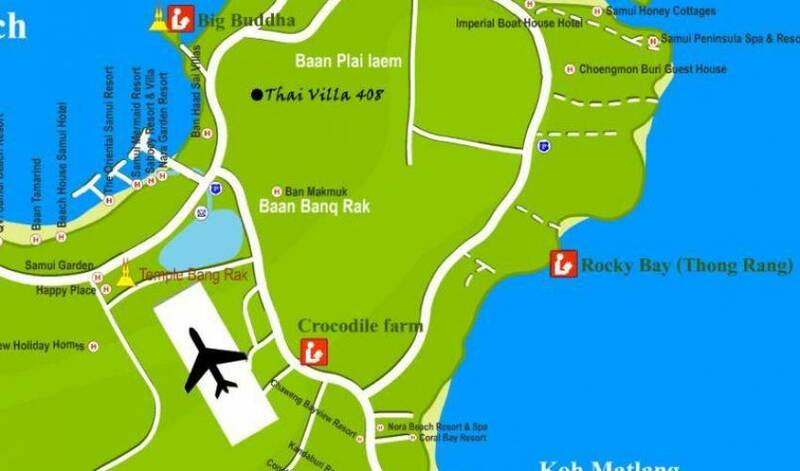 On the north coast of Koh Samui 5 kms from Samui's international airport.